Every so often an app comes around that fits the iOS platform perfect and creates a truly remarkable feel. Thanks to the developers at State of Play Games, Lume for iPod Touch and iPhone fits this profile quite well. Lume is a one of a kind game with completely unique pop up “paper and card” visuals coupled with mind bending puzzles. I’m using my iPhone 4S for this review. Lume should receive special credit for its unique visuals and the method used to create them. State of Play games actually made a paper set, and paper characters, illuminated the set and then filmed each movement through stop motion animation. 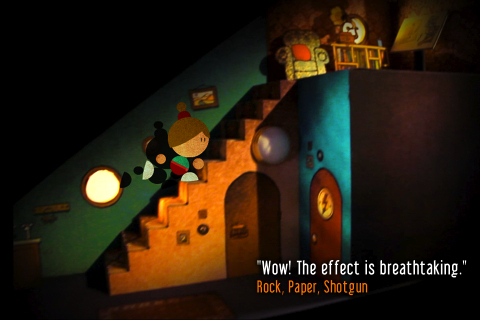 The effect is truly striking and brings with it a charm seldom seen within modern gaming. Accompanying the one of a kind visuals is an equally pleasant, ambient soundtrack that adds a warm layer of class to all proceedings. The story in Lume goes as follows. A young girl goes to visit her grandfather’s house, but soon discovers that he’s had a power outage. It’s now up to the player, through the girl, to restore the power just in time for her grandfathers return. This is all accomplished through a variety of different puzzles. These puzzles range from the most basic of brain teasers to the most obtuse of mind benders. The puzzles that will take the longest to complete in Lume, and this is generally because Lume is just ridiculously short. I appreciate the artistic intent behind Lume’s truly gorgeous visuals, but when the entire title is restricted to just a few rooms in a house, with only a handful of puzzles in each one, you will find it difficult to make this game last more than a couple of hours. Lume comes with a built in hint system, although I strongly recommend against using it if you really want to tease your brain. This is because the hints can be seriously obvious, cutting an already short game down even more. Once completed there is little incentive to replay this iPhone app. The entire title is so memorable thanks to its unique style that I find it hard to forget the tiny house in which Lume takes place. It is lucky then that Lume is reletively cheap, as I would have found it hard to recommend if it had been any more expensive. If you have $1.99 to spare, and are looking for an adventure based puzzler that is a little different from the norm, then look no further than Lume. Also available for the iPad as Lume HD $2.99 in the App Store. Lume 2 is coming: Thanks to the success of Lume and the revenue it has generated, the developers are already working on Lume 2. 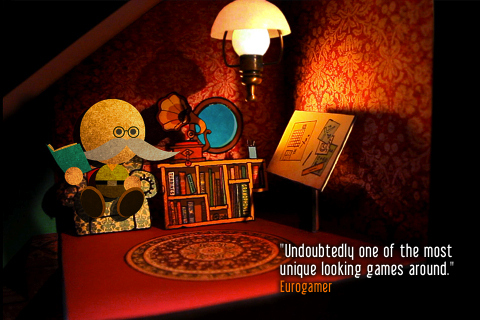 The sequel in planning will be “bigger, more beautiful and be more puzzling” says State of Play, which is great news. To see some very rough sketches of Lume 2 take a look at the post on the State of Play blog. AppSafari review of Lume was written by Joe Seifi on March 22nd, 2012 and categorized under Adventure, App Store, Featured, Fun, Games, Puzzler. Page viewed 5104 times, 1 so far today. Need help on using these apps? Please read the Help Page. I played Lume HD on iOS and there was no hint system. Is there really one in the non HD version as your review states? And how do you enable it? The lack of hints in this game is its biggest failing because you just don’t know where you can click.